Twenty-one of the top 25 occupations with the highest projected growth over the next decade were captured in the first round of Research & Planning's (R&P) New Hires Survey. The New Hires Survey, funded by the Labor Market Information Improvement Grant, is designed to capture data related to necessary skills, education, and an employer's satisfaction with newly hired employees. The first round of the survey captured data on 373 occupations for 2,757 new hires from fourth quarter 2009. Random sampling insured that data collected were representative of major industry, unemployment insurance claimants, and registered Wyoming at Work clients. Combining the survey data with R&P's administrative databases allows for analysis of job durability and wage progression arrayed against industry, occupation, age, gender, workforce services received, and labor exchange training programs. An in-depth article examining the results of the New Hires Survey will be included in a future issue of Wyoming Labor Force Trends. 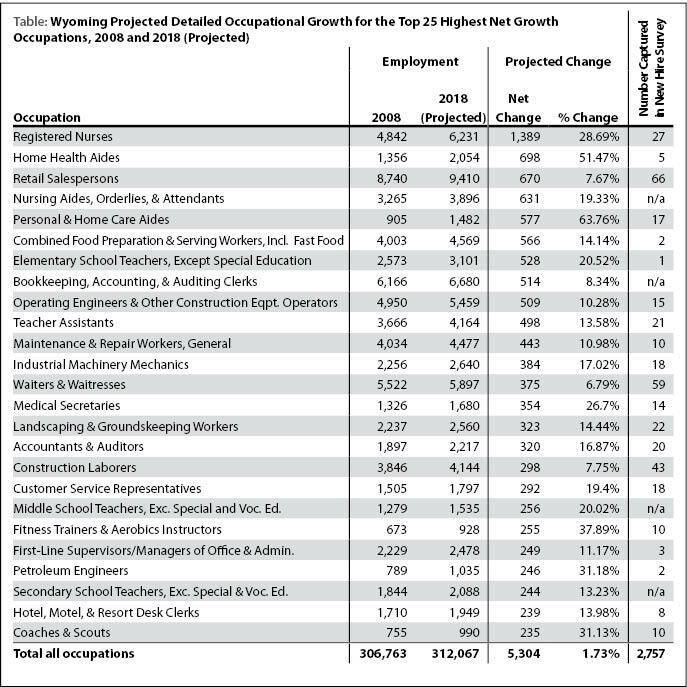 The latest occupational projections are available online from R&P at http://doe.state.wy.us/LMI/projections/LT_occ_0818.htm. Last modified by Michael Moore.